Especially after the complete opening of Star Wars: Galaxy’ Edge later this year—it will see a partial opening on August 29th—there’s the real potential for challenges in getting to Disney’s Hollywood Studios, the theme park in which Star Wars: Galaxy’s Edge will be found in Walt Disney World. The main point I am concerned about is congestion on the roadways to Disney’s Hollywood Studios, yielding back-ups and delays for those who use their cars or the bus-based component of the Disney transportation system to get to that park. There are two groups of hotels from which you can get to Galaxy’s Edge without being on a road—the Epcot resorts, from which you can walk, and the Skyliner resorts, from which you can take a gondola. I am a little less ken on the Gondola resorts, for two reasons. First, the opening date for gondola operations has not yet been announced. I think it would be nuts for Galaxy’s Edge to partially open on August 29 without the gondolas operating—but Disney has surprised me before. Second, the best strategy for seeing Galaxy’s Edge without a wait is to arrive before everyone else, and it is not clear—and may not be for a while—how early in the morning the Skyliner will begin operations. In contrast, walking from the Epcot resorts can be done now, and at any time of day or night. The Epcot resorts are substantially more expensive than the Gondola resorts (at least until Disney’s Riviera Resort opens), but staying in one of them is the best way to guarantee access to the front of Disney’s Hollywood Studios at the time you intend to get to there, as all the variables are under your own control. From the Epcot resorts you can walk to Disney’s Hollywood Studios whenever you want, even in the middle of the night—which might be required. The Epcot resorts are all within a mile’s walk of Disney’s Hollywood Studios, via a path on the side of the BoardWalk Villas that’s closest to the Swan and Dolphin. On the map, I’ve drawn the shared part of the path in red, and then used individual other colors to highlight the paths from the main entrances of the resorts to this common path. 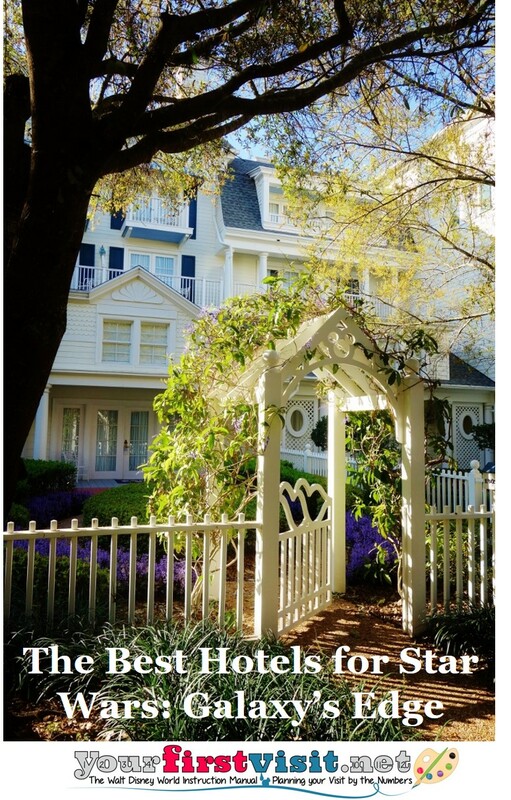 The shortest walk to Disney’s Hollywood Studios is from the BoardWalk Inn and BoardWalk Villas—with some Villas rooms twice as close to the Studios as the most distant Beach Club rooms. 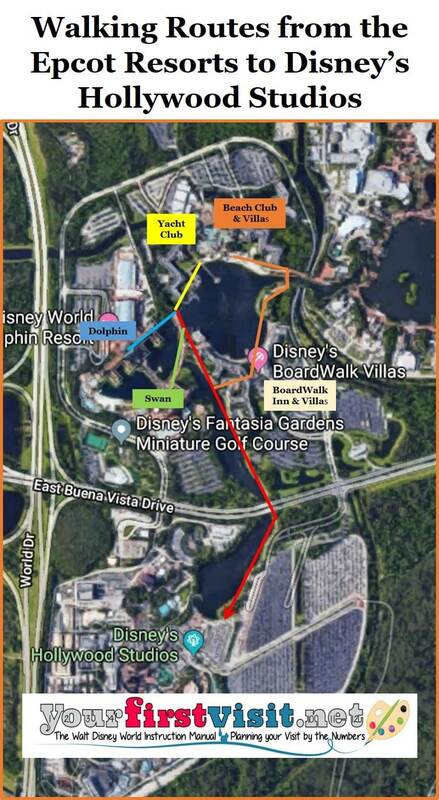 You’ll note on the map that the Swan, Dolphin, and Yacht Club have colored lines about the same length—indicating that they are about equal walks, and that while some Beach Club rooms will be almost as close as some Yacht Club rooms, in general Beach Club and Beach Club Villas guests will typically have the longest walks. There are many other factors for choosing among these resorts, all detailed in the reviews you’ll find in the links, based on my 25+ stays in these hotels. Those visiting during the partial opening period may find some difficulty in booking an Epcot resort, as these are popular this time of year because of Epcot’s fall Food & Wine Festival, and also see some major conventions in October. But at least as of today, you can find openings—the claims you will hear from some that “the Disney hotels filled as soon as Star Wars was announced” simply aren’t true. That said, while there is availability, rooms are still hard to find, especially for longer trips and trips that include Friday and Saturday nights. 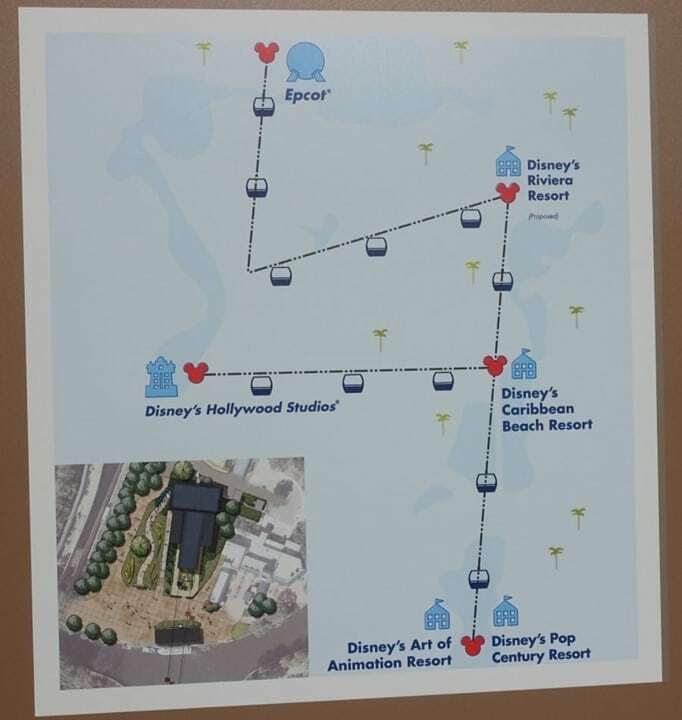 Disney’s Skyliner gondola system, currently undergoing testing, will link Disney’s Art of Animation, Pop Century, Caribbean Beach, and, after it opens at the end of the year, the much more expensive Disney’s Riviera resort, to Epcot and Disney’s Hollywood Studios. So from the Disney Skyliner resorts, once the Skyliner opens, you can take a gondola to Disney’s Hollywood Studios. I am more concerned about this option, as while it will be fine for guests returning from a late night visit, we don’t yet know how early in the morning it will being running. All Skyliner resort guests except those at Caribbean Beach Resort will need to change gondolas at the Caribbean Beach station, so folks staying at Caribbean Beach will be in the best location for gondola access to Galaxy’s Edge. Standard rooms at Pop Century and Art of Animation are a bit cheaper, but there are many pros and cons to all three resorts, detailed in the reviews at the links above based on my 30 stays among them. Note also that the Bonnet Creek resort area, a privately owned plot including hotels owned by third parties, is literally right next to Caribbean Beach. As the crow flies, the closest rooms in the Bonnet Creek Resort Area* are just a third of a mile from the Caribbean Beach Skyliner station. But there is nothing like a path you can actually take, so the hike from these to the Caribbean Beach station is actually more like 2 miles, with no actual walking path —just grassy verges—for most of this distance. And that’s assuming that security will let you walk into the resort, which frankly is not known now. If such access is permitted, then the walk will get a bit better for this after Riviera station opens, as it will be a shorter walk. *The Wyndham Resort, Wyndham Grand, Waldorf Astoria Orlando, and Hilton Orlando Bonnet Creek. Note that the last two of these are both newly eligible for both Extra Magic Hours and FastPass+ at 60 days but also are the furthest from the Skyliner (regardless of route). The Extra Magic Hour access could be quite valuable for Galaxy’s Edge. At least for the time being, Star Wars: Galaxy’s Edge won’t be offering FastPass+ access, but the FastPass+ at 60 days access is handy for many other rides. The long time travel agent partner of this site, Kelly, can try to get you into an Epcot resort, a Skyliner resort—or any other Walt Disney World hotel! Contact her using the form below. Hi Dave, we already had an AOA hotel reservation before learning of the early opening of SW. We want to go to HS but aren’t interested in going into SW. Typically we drive everywhere….but from what I’m reading it sounds like our best bet is to take the Skyliner, should it be open (our trip is Thanksgiving week). And the second choice would be the bus. Am I reading that right? We usually arrive at parks around 9-10 am b/c we have some older adults who don’t do early mornings…but in this case I’m thinking if we don’t go earlier we won’t get into HS at all. I’ve also considered only doing evenings at HS but am worried it would hit capacity and we wouldn’t get in. We would have dining res and the FP set up for HS. I’m aware we might have to scrap all that if we can’t get into HS. Any advice would be welcome. Thank you! Jane it’s hard to say right now–especially since we don’t know the opening date of the second star wars ride. Thanks! I had forgotten about phases of closure. We will definitely choose gondolas 1st if possible and bus 2nd. Hi Jane, yes it is (sort of) too early. I can give you “rough draft” best and worst days right now, and will be able to give you more definitive thoughts in early June. The complexity to either is that I expect the HS EMH schedule to change, because of Star Wars, perhaps several times, and such might have an impact on the ebb and flow of crowds in the parks. If you’d like the rough draft, let me know! Yes, please give me the rough draft. I’m thinking ahead to my ADR day of May 27. Even though things might change I still want to work on it. BTW following your advice of avoiding the park with the EMH has led to two great vacations during a high crowd time. Thank you so much! Hi Jane, first, separate from the open issues around Galaxy’s Edge Thanksgiving week, especially Sunday-Friday, itself is a bear. During such crowded times having good FastPass+ and daily plans matter more in general than picking the best days. While the HS EMH schedule may change this, in general avoid HS every day except on days I say to avoid MK. Hey Dave- Despite planning months ago to enjoy WDW before Galaxy’s edge, our arrival date falls exactly on August 29th. Bummer, but a good bummer. We’d still like to briefly visit HS on Friday 8/30- only for a couple scheduled FP+ rides. In and out. I’m a big believer in your “4 Lines of Galaxy’s Edge” theory, and am trying to follow the path of least resistance. I’m proposing arriving mid-morning to allow the first crush to stabilize. After reading this article, I’m thinking taking a Minnie-van to Boardwalk and then walking over, thereby eliminating the traffic to the park. Since I’m only riding FP+ rides, I’d have to think my ONLY line will be entry to the park. Thoughts? Mike–where are you taking the Minnie Van from?